In performing noncardiac surgery on patients on anticoagulation, the major concern is when it is safe to perform surgery without increasing the risk of hemorrhage or increasing the risk of thromboembolism (eg, venous, arterial) after discontinuing treatment. In treating patients on long-term warfarin (Coumadin) perioperatively, consider the risks of hemorrhage or thromboembolism versus the benefit from the operation. When considering noncardiac surgery, these factors and the need to weigh the risk of hemorrhage against that of thromboembolism must be analyzed on an individual patient basis. Certain procedures (eg, oncologic procedures, threats to limb or life) are easy analyses. More complex discussions must be had for such cases as hernia repair of other elective nonurgent operations. The approach options for these patients can be one of the following: continue warfarin therapy, withhold warfarin therapy for a period of time before and after the procedure, or temporarily withhold warfarin therapy and also provide a "heparin bridge" during the perioperative period. Which management option to follow is primarily determined by the characteristics of the patient and by the nature of the procedure. The American College of Chest Physicians proposed guidelines for antithrombotic prophylaxis in patients with different risk factors, and it recommends that if the annual risk for thromboembolism is low, warfarin therapy can be withheld for 4-5 days before the procedure without bridging. Patients with prosthetic heart valves pose a particular problem. Arterial thromboembolism from the heart often results in death (40% of events) or major disability (20% of events). The greatest problem encountered is that no consensus exists regarding the optimal perioperative management of anticoagulation for patients who have been receiving long-term warfarin therapy. Some prospective studies have suggested that patients on long-term warfarin therapy who undergo minor invasive procedures and are taken off their oral anticoagulation for up to 5 days have a less than 1% risk of experiencing a thromboembolic event. It has been suggested that patients on long-term warfarin therapy (including those with mechanical heart valves or atrial fibrillation) who are undergoing minor elective invasive outpatient procedures (eg, colonoscopy, dental procedures) may have a slightly increased risk of perioperative bleeding if placed in some form of heparin therapy (eg, heparin bridge) than those who have their oral anticoagulation withheld for 4-5 days (major hemorrhage 3.7% vs 0.2% and significant nonmajor hemorrhage 9% vs 0.6%, respectively). The perioperative risk of bleeding when using a heparin bridge appears to be higher and the risk of thromboembolic events appears to be lower when Coumadin is stopped than what is reported elsewhere in the literature. N-acetylcysteine is known to impair hemostasis when used for the prevention of perioperative inflammation and ischemia-reperfusion injury. Wijeysundera et al sought to determine whether N-acetylcysteine is associated with increased blood loss and blood product transfusion in 89 patients with preexisting moderate renal insufficiency undergoing cardiac surgery. Another 88 patients received placebo. At moderate risk for thromboembolism, it is proposed to base the plan for bridging versus no bridging on the individual patient rather than a generalized consensus. The bridging anticoagulation can be done with therapeutic-dose SC LMWH, therapeutic-dose IV UFH, or low-dose SC LMWH based on the patient. At low risk for thromboembolism, low-dose SC LMWH or no bridging over bridging with therapeutic-dose SC LMWH or IV UFH is recommended. In patients with a drug-eluting coronary stent who require surgery within 12 months of stent placement, continuing aspirin and clopidogrel in the perioperative period is also recommended. In patients on VKAs who are undergoing minor dental procedures, continue the VKAs around the time of the procedure as well as coadminister an oral prohemostatic agent. In patients on VKAs who are undergoing minor dermatologic procedures or cataract removal, continue the VKAs perioperatively. 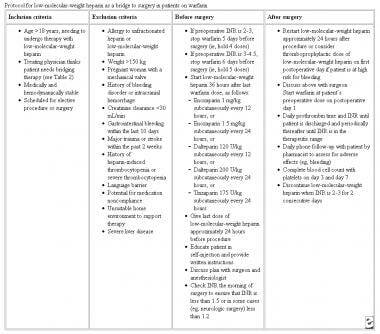 The table below depicts which patients should receive heparin bridging before surgery. Which patients on warfarin should receive heparin bridging before surgery? Adapted from Cleveland Clinic Journal. For excellent patient education resources, see eMedicineHealth's patient education article Deep Vein Thrombosis (Blood Clot in the Leg, DVT). Any patient who is on long-term anticoagulation and is to undergo a major surgery needs proactive management. Some authors believe that patients can be maintained on oral anticoagulation for minor procedures, such as dental extractions, biopsies, ureterorenoscopy, Ho:YAG lithotripsy, and ophthalmic operations, as long as the therapeutic range of the prothrombin time (PT) value is not greater than 2.5. A recently published study revealed a higher rate of hemorrhagic complications after glaucoma surgery in patients on anticoagulation or antiplatelet therapy. Patients who continued anticoagulation during glaucoma surgery had a hemorrhagic complication rate of 31.8% compared to 3.7% of patients with no anticoagulation or antiplatelet therapy. Local bleeding with dental surgery may be controlled with tranexamic acid mouthwash orepsilon aminocaproic acid mouthwash. Currently, it is generally recommended that patients with the highest risk of arterial or venous thromboembolism, who require interruption of oral anticoagulant therapy for surgery, should receive therapeutic-dose heparin therapy (eg, unfractionated heparin [UFH], low molecular weight heparin [LMWH]) during much of the interval when the international normalized ratio (INR) is subtherapeutic. Patients with prosthetic heart valves usually are treated with perioperative LMWH, although randomized controlled trials validating this method are lacking. Coumadin can be stopped 4-5 days preoperatively, with LMWH started the next day at a therapeutic dose. The last dose should be 12 hours preoperatively. LMWH and Coumadin can be retitrated the evening of the operative day. LMWH is stopped when the Coumadin reaches the target range. For patients at higher risk of valve thrombosis (ie, patients with 2 prosthetic valves or with caged-ball type of valves), whether LMWH provides adequate anticoagulant protection is unclear. For these patients, consider use of perioperative UFH instead of LMWH. Preoperatively, the heparin should be stopped 6 hours before the procedure. Postoperatively, the heparin can be restarted when the surgeon agrees that it is safe, usually 6-12 hours postoperatively. Prophylactic and therapeutic doses of LMWH in perioperative anticoagulation management are tabulated below. Perioperative anticoagulation management. Low molecular weight heparin, prophylactic doses, and therapeutic doses. Several protocols have been developed to care for patients taking oral anticoagulants. Regardless of the protocol used, the period of subtherapeutic oral anticoagulation should be kept to a minimum in patients with previous embolism and in others who are at highest risk for embolism. Kearon formulated a preoperative and postoperative strategy divided into sites of embolic disease. His recommendations are summarized below. In patients with previous arterial embolism, only 4 daily doses of warfarin should be withheld preoperatively and the INR should be measured the day before surgery to determine if a small dose of vitamin K is needed to accelerate the reversal of anticoagulation. If the INR is more than 1.7 on the day before surgery, administer 1 mg of vitamin K subcutaneously and repeat the INR the morning of the surgery. If on the day of surgery the INR is 1.3-1.7, administer 1 unit of frozen plasma; administer 2 units of frozen plasma if the INR is 1.7-2. The active reversal of oral anticoagulants should be discouraged in patients with mechanical valves, especially with the use of fresh frozen plasma. For a patient who has had an arterial thromboembolism within a month of surgery, start intravenous UFH when the INR drops to less than 2 to minimize the risk of recurrent embolism. Discontinue the intravenous heparin 6 hours before surgery. After an acute episode of venous thromboembolism (VTE), defer surgery, if feasible, until patients have received at least 1 month, and preferably 3 months, of anticoagulation. If surgery must be performed within 1 month of an acute VTE, intravenous UFH should be administered while the INR is less than 2. If surgery must be performed within 2 weeks after an acute episode, intravenous heparin may be withheld 6 hours preoperatively and 12 hours postoperatively, if the surgery is short. If the acute event was within 2 weeks of major surgery and/or patients have a higher risk of postoperative bleeding, a vena caval filter should be inserted preoperatively or intraoperatively. Warfarin should be withheld for only 4 doses if the most recent episode of VTE occurred 1-3 months before surgery. If the patient has been anticoagulated for 3 or more months, 5 doses of warfarin can be withheld before surgery. Preoperatively, subcutaneous UFH or LMWH is needed only for immobilized inpatients with an INR of less than 1.8. 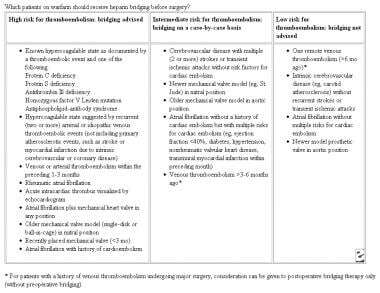 The table below gives a protocol for LMWH as a bridge to surgery in patients on warfarin. Protocol for low molecular weight heparin as a bridge to surgery in patients on warfarin. Adapted from Cleveland Clinic Journal. The first of several NOAC reversal agents, idarucizumab (Praxbind), was approved by the FDA in October 2015. Idarucizumab is a monoclonal antibody that binds specifically to dabigatran (it does not affect other NOACs). It is approved for patients treated with dabigatran when reversal of the anticoagulant effects are needed for emergency surgery or urgent procedures, or in the event of life-threatening or uncontrolled bleeding. If surgery is performed within 1 month after an episode of arterial thromboembolism, intravenous heparin is warranted until the INR reaches 2 if the risk of bleeding is not very high. Administer intravenous UFH without a loading dose 12 hours after surgery at a rate of no more than 18 U/kg/h. Defer the first activated partial thromboplastin time (aPTT) for 12 hours to attain a stable anticoagulant response. Postoperative intravenous heparin is not recommended for patients who undergo major surgery and who are at high risk for anticoagulant-induced bleeding, even if an episode of arterial embolism has occurred within 1 month before surgery. Instead, administer subcutaneous UFH or LMWH (3000 U bid) until the INR reaches 1.8. If the patient had an episode of VTE within 3 months before surgery, intravenous UFH is recommended until the INR is greater than or equal to 2. Patients who have a vena caval filter are protected from pulmonary embolism, and intravenous heparin can be avoided in their early postoperative period. If no previous episodes of VTE occurred within 3 months, postoperative intravenous heparin is not indicated. Subcutaneous heparin is recommended. Madura et al recommend discontinuing Coumadin 5 days before surgery and beginning intravenous heparin at 1000 U/h, while adjusting to maintain the aPTT at therapeutic levels. Heparin is discontinued 6-12 hours before surgery and restarted at 200-400 U/h at 4-6 hours after surgery. Coumadin is restarted as soon as tolerated by the patient. Stop oral anticoagulants at least 5 days preoperatively, and do not perform the procedure until the PT is in the reference range. Substitute intravenous heparin infusion for oral anticoagulant therapy preoperatively to prevent thromboembolic complications in the perioperative period. Stop the intravenous heparin infusion 6-12 hours preoperatively to allow the aPTT to return to normal for adequate intraoperative hemostasis. Restart the intravenous heparin infusion within 6 hours of completion of the surgical procedure to prevent postoperative thromboembolism. Resume oral Coumadin therapy as soon as the patient is able to tolerate oral liquids. Do not release the patient until the PT is once again in the therapeutic range. Perioperative management of anticoagulation entails an understanding of all thromboembolic events, indications for treatment, and duration of treatment. [18, 19, 20] The American College of Chest Physicians for Prevention of Thromboembolism published the following guidelines. An updated guideline was published in 2008  and 2012  . A full listing is available at American College of Chest Physicians. Higher-risk general surgery patients prone to wound complications (eg, hematomas, infection) - IPC is an alternative. Which risks must be considered in surgical patients taking anticoagulants? What are the options for perioperative anticoagulation management? According to the American College of Chest Physicians (ACCP) antithrombotic prophylaxis guidelines, when can warfarin be withheld in perioperative anticoagulation management? What are the risks of warfarin therapy for perioperative anticoagulation management in patients with mechanical heart valves? What are the risks of N-acetylcysteine in perioperative anticoagulation management? What is the efficacy of a periprocedural bridging strategy with low-molecular-weight heparin (LMWH) for the management of anticoagulation? What are the American College of Chest Physicians (ACCP) Evidence-Based Clinical Practice Guidelines for perioperative anticoagulation management? What is the pathophysiology of deep venous thrombosis relative to perioperative anticoagulation management? What are the indications for perioperative anticoagulation management? According to the American Society of Gastrointestinal Endoscopy, which endoscopic procedures do not require changes to perioperative anticoagulation management? Which low bleeding-risk endoscopic procedures do not require changes to perioperative anticoagulation management? According to the American Society of Gastrointestinal Endoscopy, which endoscopic procedures require changes to perioperative anticoagulation management? When is antithrombotic therapy indicated in perioperative anticoagulation management? What is the perioperative anticoagulation management for patients with prosthetic heart valves? What are the prophylactic and therapeutic doses of LMWH for perioperative anticoagulation management? What are the contraindications of antithrombotic therapy in perioperative anticoagulation management? Which lab studies are needed for perioperative anticoagulation management? What is the perioperative anticoagulation management of patients with previous arterial embolism? What is the perioperative anticoagulation management of patients with venous thromboembolism (VTE)? What are the risk categories for thromboembolism? What is the protocol for use of LMWH as a bridge to surgery? What is the role of novel oral anticoagulants (NOACs) in perioperative anticoagulation management? What is the role of idarucizumab in perioperative anticoagulation management? What is the role of coagulation factor Xa recombinant (AndexXa) in perioperative anticoagulation management? What is the role of IV heparin in postoperative anticoagulation management? What is the postoperative management of perioperative anticoagulation in patients with recent venous thromboembolism (VTE)? What are the American College of Chest Physicians (ACCP) guidelines for perioperative management of anticoagulation? What is the basis for decisions to interrupt anticoagulation during perioperative management? Wijeysundera DN, Karkouti K, Rao V, et al. N-acetylcysteine is associated with increased blood loss and blood product utilization during cardiac surgery. Crit Care Med. 2009 Jun. 37(6):1929-34. [Medline]. Di Biase L, Burkhardt JD, Santangeli P, Mohanty P, Sanchez JE, Horton R, et al. Periprocedural stroke and bleeding complications in patients undergoing catheter ablation of atrial fibrillation with different anticoagulation management: results from the Role of Coumadin in Preventing Thromboembolism in Atrial Fibrillation (AF) Patients Undergoing Catheter Ablation (COMPARE) randomized trial. Circulation. 2014 Jun 24. 129(25):2638-44. [Medline]. Douketis JD, Spyropoulos AC, Kaatz S, Becker RC, Caprini JA, Dunn AS, et al. Perioperative Bridging Anticoagulation in Patients with Atrial Fibrillation. N Engl J Med. 2015 Jun 22. [Medline]. O'Riordan M. BRIDGE: No Benefit From Perioperative LMWH in Patients With AF. Heartwire from Medscape. Available at http://www.medscape.com/viewarticle/846892. June 23, 2015; Accessed: August 19, 2015. Douketis JD, Berger PB, Dunn AS, et al. The perioperative management of antithrombotic therapy: American College of Chest Physicians Evidence-Based Clinical Practice Guidelines (8th Edition). Chest. 2008 Jun. 133(6 suppl):299S-339S. [Medline]. [Full Text]. Douketis JD, Spyropoulos AC, Spencer FA, Mayr M, Jaffer AK, Eckman MH, et al. Perioperative management of antithrombotic therapy: Antithrombotic Therapy and Prevention of Thrombosis, 9th ed: American College of Chest Physicians Evidence-Based Clinical Practice Guidelines. Chest. 2012 Feb. 141(2 Suppl):e326S-50S. [Medline]. [Full Text]. Akl EA, Labedi N, Terrenato I, Barba M, Sperati F, Sempos EV, et al. Low molecular weight heparin versus unfractionated heparin for perioperative thromboprophylaxis in patients with cancer. Cochrane Database Syst Rev. 2011 Nov 9. 11:CD009447. [Medline]. Douketis JD. Perioperative management of patients receiving anticoagulant or antiplatelet therapy: a clinician-oriented and practical approach. Hosp Pract (Minneap). 2011 Oct. 39(4):41-54. [Medline]. Turna B, Stein RJ, Smaldone MC, et al. Safety and efficacy of flexible ureterorenoscopy and holmium:YAG lithotripsy for intrarenal stones in anticoagulated cases. J Urol. 2008 Apr. 179(4):1415-9. [Medline]. Law SK, Song BJ, Yu F, et al. Hemorrhagic complications from glaucoma surgery in patients on anticoagulation therapy or antiplatelet therapy. Am J Ophthalmol. 2008 Apr. 145(4):736-746. [Medline]. Garwood CL, Hwang JM, Moser LR. Striking a balance between the risks and benefits of anticoagulation bridge therapy in patients with atrial fibrillation: clinical updates and remaining controversies. Pharmacotherapy. 2011 Dec. 31(12):1208-20. [Medline]. Nuttall MT, Rodgers GM. Perioperative management of antithrombotic therapy in cardiovascular patients. Methodist Debakey Cardiovasc J. 2011 Oct. 7(4):10-4. [Medline]. Kearon C. Perioperative management of long-term anticoagulation. Semin Thromb Hemost. 1998. 24 suppl 1:77-83. [Medline]. Jaffer AK, Brotman DJ, Chukwumerije N. When patients on warfarin need surgery. Cleve Clin J Med. 2003 Nov. 70(11):973-84. [Medline]. Lai A, Davidson N, Galloway SW, Thachil J. Perioperative management of patients on new oral anticoagulants. Br J Surg. 2014 Jun. 101(7):742-9. [Medline]. Madura JA, Rookstool M, Wease G. The management of patients on chronic Coumadin therapy undergoing subsequent surgical procedures. Am Surg. 1994 Jul. 60(7):542-6; discussion 546-7. [Medline]. Kraai EP, Lopes RD, Alexander JH, Garcia D. Perioperative management of anticoagulation: guidelines translated for the clinician. J Thromb Thrombolysis. 2009 Jul. 28(1):16-22. [Medline]. Scharf RE. Management of bleeding in patients using antithrombotic agents. Hamostaseologie. 2009 Sep. 29(4):388-98. [Medline]. Tanaka KA, Key NS, Levy JH. Blood coagulation: hemostasis and thrombin regulation. Anesth Analg. 2009 May. 108(5):1433-46. [Medline]. American College of Chest Physicians. The Seventh ACCP Conference on Antithrombotic and Thrombolytic Therapy. 2004. 126(3 suppl):214S -215S. Wamala H, Scott IA, Caney X. Perioperative management of new oral anticoagulants in patients undergoing elective surgery at a tertiary hospital. Intern Med J. 2017 Dec. 47 (12):1412-1421. [Medline]. American College of Chest Physicians. Proceedings of the American College of Chest Physicians 5th Consensus on Antithrombotic Therapy. 1998. Chest. 1998 Nov. 114(5 Suppl):439S-769S. [Medline]. Douketis JD. Perioperative anticoagulation management in patients who are receiving oral anticoagulant therapy: a practical guide for clinicians. Thromb Res. 2002 Oct 1. 108(1):3-13. Garcia DA, Regan S, Henault LE, et al. Risk of thromboembolism with short-term interruption of warfarin therapy. Arch Intern Med. 2008 Jan 14. 168(1):63-9. [Medline]. Jafri SM. Periprocedural thromboprophylaxis in patients receiving chronic anticoagulation therapy. Am Heart J. 2004 Jan. 147(1):3-15. [Medline]. Lanzat M, Danna AT, Jacobson DS. New protocols for perioperative management of podiatric patients taking oral anticoagulants. J Foot Ankle Surg. 1994 Jan-Feb. 33(1):16-20. [Medline]. O'Donnell M, Kearon C. Perioperative management of oral anticoagulation. Clin Geriatr Med. 2006 Feb. 22(1):199-213, xi. [Medline]. Rutherford R. Fundamental therapeutic and technical consideration. Vascular Surgery. Philadelphia, Pa: WB Saunders Company; 1995.